Our Skittles group welcomes NEW members, especially men, to balance the numbers. Join us for a morning of gentle exercise, friendship and fun. We meet at Walton Village Hall at 10.00am. on Wednesday February 8th. and 22nd. and March 8th. and 22nd. 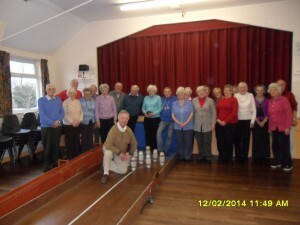 After many years of hard work, Lou Hancock is standing down as Organiser of the Skittles Group. Michael Jones has been approached by Patrick Counsell regarding this, and they have agreed to organise this activity between them, with some assistance from Bill Barber. Our thanks go to them all. Michael & Patrick’s names will be put on the front of the Newsletter as leaders of the Skittles Group. Dates: January 10th and 24th, February 14th and 28th, March 14th and 28th.